The very first test release of ARC 6, the alpha release 6.0.0a3, is now available for public testing. ARC 6 contains major improvements in the deployment, configuration and maintenance of ARC CE. It also comes with new features and services, while some legacy features have been removed. The interfaces are unchanged - ARC 5 clients are compatible with an ARC 6 CE and vice versa. For further details, please refer to online ARC 6 documentation (work in progress), particularly the quick installation guide. Source code is available at Gitlab. No changes in gangliarc, nagios plugins nor metapackages. Please read the release notes for details. The updated packages are available for download from our repositories if you have the updates repository enabled. For the first time we invite ARC developers, system administrators and interested ARC users to the ARC6 Retreat, to be held on November 7-9 in Umeå, Sweden. The purpose of the event is to introduce the next major ARC release, ARC6, to site administrators and community developers. Participation is free of charge, but registration is required. The 2018 NorduGrid conference will be held in Munich (Garching campus) on June 4-7. Plenary sessons on Monday and Tuesday will be followed by the usual ARC technical workshop. Registration is open until May 24. Two weeks are left before the NorduGrid F2F in Ljubljana, which will be held from November 28 to December 1. The main focus of the meeting will be preparation to the major ARC6 release. Please register to help the organisers! The updated packages are available for download from our repositories if you have the updates repository enabled. Please see the release notes for details on the update. The 2017 NorduGrid conference will be held in Tromsø, Norway, June 27-30. The conference theme this year is "From Data Factories to Insight as a Service" and will include presentations along the main topics, in addition to ARC reports. Plenary sessons will be preceded by the usual technical workshop. Registration is open until June 19. The update NorduGrid ARC 15.03u10 is now available. This is a minor release, introducing new features and addressing bugs discovered since release 15.03u9. The updated packages are available for download from our repositories if you have the updates repository enabled. There are several bugfixes and enhancements with this version, more details in the release notes. Fedora has decided to move to OpenSSL 1.1.0 from next release (Fedora 25). To be a able to continue supporting the newest Fedora, ARC will need to implement support for OpenSSL 1.1.0 from next major release, scheduled for beginning of next year. As significant code changes are needed, some of which are not compatible with earlier OpenSSL versions, we will have to drop support for platforms depending on OpenSSL versions lower than 1.0.0. The consequence is that from ARC 6.0 only EL6+, Fedora12+, Debian 7+, Ubuntu 11.10+ will be supported. In particular notice that we will not continue support for EL5 and Ubuntu 10.04 LTS. NeIC is looking for a Storage Specialist to strengthen the Nordic Tier-1 team. As member of a dynamic virtual team you will have a variety of challenging tasks and involve extensive contact with research groups and specialist communities in the Nordic countries and internationally. For full announcement and instructions how to apply, see the job advertisement. Deadline: October 27, 2016. The update NorduGrid ARC 15.03u9 is now available. This update includes a minor update of ARC to version 5.1.3. In addition to several bug fixes this release introduces two auxiliary tools to (a) generate backtraces from core dumps generated by ARC and (b) to convert delegation DBs between BDB and SQLite (see release notes for usage and more information). Additionally, all ARC services can now be managed through the systemd system, as required by the newest Fedora. The updated packages are available for download from our repositories if you have the updates repository enabled. There are several new features and many bugfixes and enhancements with this version, more details in the release notes. The NorduGrid 2016 conference (2-3 June) and technical workshop (31 May - 1 June) are open for registration. The scientific program, the timetable and other details are taking shape at the Indico page. Workshop for HTCondor and ARC CE users will take place in Barcelona on February 29 2016 – March 4 2016. Registration is open until February 22. All user contributions are very much welcome! Those of you with reasonable amounts of experience with ARC CE and/or HTCondor, you are very much welcome to help out at the ARC "office hours" on 2 and 4 March. The updated packages are available for download from our repositories if you have the updates repository enabled. See release notes for more information. The updated packages are available for download from our repositories if you have the updates repository enabled. There have been several bugfixes with this version, more details in the release notes. The collaboration between NorduGrid, ATLAS experiment at CERN, and the Chinese Academy of Science (CAS), is rewarded by the Best Supercomputing Application Award from CAS (see the announcement, in Chinese). This was achieved by interfacing ARC-CE by NorduGrid with the Chinese HPC Grid. The award ceremony takes place in Gangzhou, the home of Tianhe 2, in October. The packages are available for download from our repositories. There have been several bugfixes and updates with this version, more details in the release notes. The NorduGrid 2015 Conference will be held at at the University of Bern (Switzerland) on June 4 and June 5, 2015. The conference brings together people from data intensive science, resource providers, developers of resource connectors and industry. On June 2 and 3 there will be open technical meetings about the ARC software. Registration is now open for both events, participation is free of charge. The updated packages are available for download from our repositories if you have the updates repository enabled. There have been several bugfixes and updates with this version, more details in the release notes. NorduGrid ARC 13.11 update 1 release is now available from our repositories. This changes the following component versions: Nordugrid ARC to 4.1.0, Nordugrid ARC doc to 1.4.0, Nagios probes for ARC CE to 1.8.0, and Common Authentication Library caNl++ to 1.1.0. There have been several bugfixes and updates with this version, more details in the release notes. Heartbleed vulnerability advisory: Several ARC services relying on openssl (A-REX with both GridFTP and WS interfaces, ACIX) are affected by the Heartbleed vulnearibility (CVE-2014-0160) and thus may be exploited. If you are running an ARC CE with either WS-interface or the GridFTP interface, or an ACIX service, we advise to update the openssl libraries and renew the host certificates. ARC itself needs no updates. The NorduGrid 2014 Conference will be co-located with the EGI Community Forum, and will take place in Helsinki on May 20. The conference will be followed by the usual technical workshop. Due to the co-location, the NorduGrid Conference registration must be made via the EGI registration portal. Still, Conference and workshop submissions, as well as the workshop poll, should be made via the NorduGrid's page, which will also host the Conference schedule. NorduGrid ARC 13.11 "Felix" release is now available from our repositories. This changes the following component versions: Nordugrid ARC to 4.0.0, Nordugrid ARC doc to 1.3.4, Nagios probes for ARC CE to 1.7.0, and Common Authentication Library caNl++ to 1.0.1. There have been several bugfixes and backwards-incompatible updates with this version, more details in the release notes. IMPORTANT: New IGTF CA packages v1.55 are available from the NorduGrid repositories. In this release, the NorduGrid CA certificate is updated. This may cause problems if you have the CA certificates installed in your Web browser. When using a browser you MUST first remove the previous NorduGrid CA certificate before installing the new certificate. NorduGrid participates in the Supercomputing '13 research exhibit. Visit our booth (nr. 1239) to learn how ARC helps in search for new particles and in harnessing HPC power for the needs of CERN computing. This year's Nobel Prize in Physics is the first to which ARC has proudly contributed. The theoretical work of Professors Englert and Higgs was supported by experimental data from ATLAS and CMS experiments at LHC, and ARC played a notable role in processing and analysing these data, as well as producing simulated data. Above 5% of all ATLAS and 9% of all CMS computing power has been provided via ARC, and these numbers are growing, as large HPC sites turn to ARC in order to provide computational support to LHC. Let's hope that this Nobel Prize is not the last that ARC will enable! NorduGrid organises a 3-days Visegrad Developer Retreat on October 1-4, to work with ARC code. Due to the hotel requirements, registration is mandatory, deadline is September 13, Friday. A bug fix release ARC 13.02 update 3 is now available from the NorduGrid repositories. It changes the following component versions: Nordugrid ARC to 3.0.3, Nordugrid ARC doc to 1.3.3, and Nordugrid ARC metapackages to 1.0.7. PhD Student Positions in Computing Science with focus on management systems for cloud computing are open at the Umeå University, Sweden. The positions are aimed for research in collaborative research projects targeting methods and software for autonomous systems management in large-scale cloud computing datacenters and come with a competitive salary for the 4-year duration of the studies. Deadline for applications: August 19, 2013. A dedicated release fixing several JURA - APEL accounting issues is out: ARC 13.02 update 2 is now available from the NorduGrid repositories. A bugfix release ARC 13.02 update 1 is now available from the EMI 3 as well as from the NorduGrid repositories. The release corresponds to the core package versions 3.0.1. Two updates to ARC 12.05 have been released within a week: 12.05 update 2 and 12.05 update 3. The former fixes a large number of bugs, while the latter fixes an issue introduced in 12.05 update 2. The binaries are available from the NorduGrid repositories. The releases correspond to the core package versions 2.0.2 and 2.0.3, respectively. ARC release 13.02, corresponding to the EMI 3 "Monte Bianco" release, is now available from the NorduGrid repositories. The release corresponds to the core package versions 3.0.0, which introduce a number of major improvements and backwards incompatible changes. Please consult release notes before upgrading. ARC command-line interface is now available on CERN's interactive logon service for Scientific Linux 6 (lxplus6). It is installed from the EPEL repository, which currently distributes ARC 12.05u1 (package version 2.0.1). The NorduGrid 2013 conference "Distributed systems and Big Data - towards new horizons" travels to Siauliai, Lithuania. It will take place on June 4-6, 2013. The conference is dedicated to future challenges faced by distributed computing and e-Infrastructures. As usual, the conference will include both the plenary sessions and thematic workshops focussed on different ARC middleware components and services. NeIC is organising its first conference in Trondheim, Norway, on May 13-16. The programme is encompassing experience of Nordic e-infrastructure collabration as well as future directions. The conference will be accompanied with several thematic workshops. The regisration is open! ARC 12.05 package update 1 is available for core components from version 2.0.0 to 2.0.1; most other components have been updates as well, see release notes. The release fixes a number of outstanding bugs. NorduGrid participated in the Supercomputing '12 research exhibit. When Big Data meets distributed computing, ARC together with other EMI products offers a powerful solution, proven by years of successfull and reliable scientific data processing. Thank you for visiting our booth!. The regular NorduGrid workshop dedicated to technical aspects of ARC development and support will take place in Kosice, Slovakia, on September 26-28, 2012. Participants are invited to register. New version of arc-gui-clients 0.2.1 is released for testing. This release mainly improves the ARC Storage Explorer (arcstorage-ui). The release is still experimental, and a number of new features is being developed. ARC 12.05 release packages are now available for all supported by NorduGrid distributions from the NorduGrid repositories. The packages correspond to the EMI 2 Matterhorn, released on 21 May 2012. This release introduces number of major improvements and new features, particularly in the client libraries and information system. Post-doc position in High Energy Physics Computing is available at the Helsinki Institute of Physics, Finland. Applications deadline is 18 April 2012. Finnish Grid Infrastructure becomes available for researchers. It continues the work started by M-grid and unites 10 computing facilities across Finland in a single research infrastructure. ARC 11.05 package update 3 is available for core components and documents from version 1.1.0 to 1.1.1. The release fixes few outstanding bugs. The NorduGrid 2012 conference will take place in Uppsala, Sweden, on May 30 - June 1, 2012. The conference is dedicated to enabling infrastructures for e-Science using ARC. As usual, the conference will include both the plenary sessions and the technical workshop dedicated to ARC development issues. NorduGrid and SwiNG organize training on developing High Throughput solutions with ARC at the EGI Community Forum 2012. Another ARC related event will be demonstration of new data staging features in ARC CE. And of course there will be a number of presentations given by ARC developers. Everybody is welcomed to these events, as well as to the SwiNG booth, where you can meet ARC experts and get the latest news. Applications are invited for 1 postdoc stipend and 2 PhD student positions within the field of distributed computing in Umeå University, Sweden. Applications deadline is 24 February 2012. CSC - IT Center for Science, in Espoo, Finland, has two open positions: System Specialist and Grid Administrator. Deadline for applications: 23rd November 2011. NorduGrid participates in the Supercomputing '11 research exhibit. The topic of the year is A-REX, the ARC Compute Element and its built-in data handling capabilities. Visit our booth #2118 and meet the experts! Our posters exhibites at SC11 are available from this site. ARC 11.05 package update 2 is available for core components from version 1.0.1 to 1.1.0 and documents from 1.0.2 to 1.1.0. GridKa school 2011 (September 5-9, Karlsruhe) will feature ARC training sessions, organised by SwING. Registration is still open! ARC 11.05 package update 1 is available for core components from version 1.0.0 to 1.0.1 and documents from 1.0.1 to 1.0.2. The first Technical Workshop of the extended NorduGrid will take place in Kiev, on 5-8 October 2011, hosted by the new NorduGrid member - the Ukrainian National Grid. Please register by 25 September 2011, and indicate what contribution (talk, discussion item) you would like to make, or what problem you'd like to be addressed. Applications are invited for a Grid researcher position within the EU EMI project in University of Oslo, Norway. Applications deadline is August 1, 2011. New NorduGrid Collaboration Agreement comes into force, signed by 11 members from 10 countries. Doors are open for new members, willing to help developing and supporting ARC products on long-term basis, using open source approaches. Debian and Ubuntu unstable distributives now contain nordugrid-arc packages from ARC v11.05 (same as in EMI 1). Apart of documents, old clients and GUI, all of ARC v11.05 is available from respective repositories. The EMI project is pleased to announce the availability of the EMI 1 (Kebnekaise) release. This release features for the first time a complete and consolidated set of middleware components from ARC, dCache, gLite and UNICORE. The services, managed in the past by separate providers, and now developed, built and tested in collaboration, follow well established open-source practices and are distributed from a single reference repository. ARC release 11.05 has been just announced at the NorduGrid 2011 conference and is available from NorduGrid repositories. Plenty of new features and important changes are detailed in the Release Announcement. Key parts of ARC 11.05 will also be available in the EMI 1 release. Ever used ARC? Take the survey! Just 10-15 minutes of your time will be a very valuable input for us! Applications are invited for 2-3 post-doc fellowships, 1 PhD student position, and 1-2 system developers within the field of Cloud computing in Umeå University, Sweden. Applications deadline is May 10, 2011. The NorduGrid 2011 conference celebrating start of the second decade of NorduGrid will take place in Norway, on May 9-12, 2011. Registration is open, and contributions are warmly invited! As usual, the conference will be followed by the technical workshop dedicated to ARC development issues and a school for ARC users. It is time to announce Grid Manager End-of-life, which heralds definitive transition to the new code base for ARC. A minor bug fix ARC release v0.8.3.1 is now available from NorduGrid repositories. The release contains bug fixes and minor enhancements, no new features or components were introduced. Starting with the v0.8.x series, the ARC production releases are created from multiple source trees and offered as source tarball bundle. The 0.8.3.1 release contains both pre-WS and WS ARC components. Applications are invited for 2-3 positions for Postdoctoral Research Fellows and Researchers at The Department of Physics University of Oslo, in the Faculty of Mathematics and Natural Sciences. Successful applicants will contribute to the European Middleware Initiative (EMI) project. We are looking for experienced researchers or software developers with a strong background and interest in middleware development for the Grid. Experience with the ARC middleware is an advantage. Applications deadline is January 7, 2011. A security update and bug fix ARC release v0.8.3 is now available. ARC 0.8.3 fixes a security issue and is strongly recommended for update. Components from ARC v0.8.3 will eventually become a part of the EMI releases. Applications are invited for two Computer Scientist positions in the Grid Computing group at the Department of Physics and Astronomy of the Uppsala University, to contribute to the European Middleware Initiative (EMI) and the Initiative for Globus in Europe (IGE) projects. The positions are to be filled soon for a period of two years. Applications deadline is November 15, 2010. The NorduGrid/ARC technical workshop will take place in Kastrup, Denmark, on October 6-7, 2010. Everybody actively involved in ARC code development and related activities is warmly welcomed. An emergency release ARC v0.8.2.2 is produced in order to fix a number of major bugs that surfaced since ARC v0.8.2.1 was released. An emergency release ARC v0.8.2.1 has been made available. It was created to provide a fix for the critical bug #1944. A milestone release ARC v0.8.2 is out. It contains a number of experimental components that can be deployed alongside the traditional ARC services for testing, and will eventually replace them. Many of them are supported on Microsoft Windows and Mac OS X platforms. In addition, the release has numerous enhancements and bug fixes; some obsolete components have been removed from the distribution. Read the dedicated ARC 0.8 series Wiki pages for more details. The 2nd Swiss Grid School will take place in Lugano, on June 22-24 2010. It provides lectures and practical lab sessions that illustrate the current state-of-the-art in Grid computing in the following domains: Grid architecture, security and middleware, resource management, data management and scientific workflow management. It also focuses on a variety of practical case studies (applications). Early registration is open until May 15. The NorduGrid 2010 conference entitled "ARC Empowering EGI" will take place in Ljubljana, Slovenia, on May 3-7, 2010. Registration is open, and contributions are warmly invited! As usual, the conference will be followed by the technical workshop. Applications are invited for several post doctoral, PhD student and system developer positions in Grid and Cloud computing at the Umea University, Sweden. All positions focus on design of algorithms, architectures and software prototypes for service-oriented Grid and Cloud computing infrastructures. The group is affiliated with RESERVOIR, NESSI, the CoreGRID Network of Excellence, SweGrid, NDGF, the Globus Alliance, and the eSSENCE national strategic e-science collaboration. Applications deadline is April 30, 2010. Bug fix release ARC v0.8.1.1 is out. It contains a number of bug fixes to v0.8.1; see Release Notes for details. Standalone client packages (tar-balls) for Ubuntu and Debian are officially available since this release. IMPORTANT! Debian and Ubuntu repositories have changed, requiring an update of your sources.list. Please consult Wiki pages for more information. EU KnowARC project and the NorduGrid collaboration are proud to announce availability of the ARC Nox Release. This release brings ARCâs new Web Service (WS) based components to a broader audience. Installation and usage instructions can be found on the release page. Registration and Call for Abstracts for the 5th EGEE User Forum are now open! Contributions are accepted on a wide range of topics in distributed computing, including those related to ARC middleware. Abstract subission deadline is December 7, and early bird registration deadline is December 31. Bug fix release ARC v0.8.1 is out. It contains a number of enhancements and bug fixes to v0.8.0; see Release Notes for details. NorduGrid participates in the Supercomputing '09 research exhibit. Demonstrations of the new components of the upcoming ARC NOX release and presentation of related projects will be given at our booth #2293. The next stable version ARC 0.8 is released. It contains a number of features that significantly improve performance and usability. Moreover, this release contains the new technology preview for the ARC job management service, A-REX; see Release Notes for details. This release is available as source and as RedHat-based and Debian-based binaries as described in the NorduGrid download site. Lund University announces two 6-months Early Stage Researcher positions in High Energy Physics and Grid Computing within the EU Marie Curie Programme. Deadline for applications: October 7, 2009. Umeå University, Sweden, announces the position of Assistant Professor in Grid Computing. Application submission deadline is August 15, 2009. CSC and NDGF are staging an ARC training at PDC (Stockholm, KTH campus, Teknikringen 14) on June 16, 2009, 11:00 to 18:30. New IGTF CA packages v1.30 are available from the NorduGrid repositories. Several CAs are added in USA, Germany and Switzerland, and metadata updated for Belarus and Germany's DFN CAs. The current stable ARC (0.6.5) standalone packages have been updated to include these certificates. NorduGrid and BalticGrid II signed a MoU laying foundation for deeper cooperation between the initiatives. HPC2N and NDGF will host the HEPiX 2009 Spring meeting in Umeå, Sweden, May 25th to May 29th 2009. Registration, presentation submissions and the timetable are handled in the Indico agenda server. ARC components will be a part of the Unified Middleware Distribution - a middleware solution enabling the future European Grid infrastructure to be built by the European Grid Initiative (EGI). Other major contributors are gLite and Unicore. NDGF joins the NorduGrid Collaboration following the official approval by the NorduGrid Steering Committee. Invitations are also extended to a number of other organisations in different countries. IMPORTANT: New IGTF CA packages v1.28 are available from the NorduGrid repositories. The current stable ARC (0.6.5) standalone packages have been updated to include these certificates. This release is particularly important for Denmark, Finland, Iceland, Norway and Sweden since it includes an update to the NorduGrid CA certificate. Technology preview of ARC 0.9.3 is presented at the OGF25 tutorials, meetings and the NorduGrid booth. For downloads, installation instructions and other materials, visit the dedicated page. The next NorduGrid technical meeting will take place on April 1-3 in Uppsala, Sweden. It will be preceded with two days of the KnowARC project meetings. We invite everybody involved in development of ARC middleware to take part. Programme and registration are available via the meeting's agenda page. Applications are invited for several post doctoral and PhD student positions in Grid computing and virtualization technology at the Umea University, Sweden. All positions focus on design of service-oriented Grid infrastructure in projects funded by the Swedish Research Council and the EU. The group is affiliated with the Globus Alliance, RESERVOIR, NESSI, the CoreGRID Network of Excellence, SweGrid, NDGF, and EGEE. ARC 0.6.5 "Earthquake" is now officially released and binary packages (for RPM-based distributions) are available from the download area and through the YUM repositories. Version 0.6.5 is a bug fix release. Security: new IGTF CA packages v1.26 are available from the NorduGrid FTP server and repositories. Updates include some new certficates (IN, BE), some updates to the existing ones, and some were removed. Applications are invited for a research fellowship ("stipendiat") in the field of Grid Computing at the University of Oslo, Norway. The position is for a period of three years and the starting date is 15 January 2009 or soon thereafter. The middleware to be developed in the project will be based on the NorduGrid collaboration's Advanced Resource Connector (ARC) middleware. Registration is open for the Workshop on ATLAS distributed analysis, using ARC-enabled resources, which takes place in Oslo, January 7-9, 2009. The workshop will include ATLAS software tutorial, GANGA tutorial, and discussions/feedback on DA on NDGF, and future GANGA/ARC and pathena/ARC developments. NorduGrid is proud to contribute to the newly launched OGF standardization effort: the Production Grid Infrastructure Working Group (PGI-WG) is a spin-off of the GIN activities that focuses on delivering a set of profiles, and additional specifications if needed, for job and data management that are aligned with a Grid security and information model in order to address the needs of production Grid infrastructures. NorduGrid's Balázs Kónya is a co-chair of the group. Nordic DataGrid Facility (NDGF) invites applications for Grid middleware developer positions. Successful applicants are expected to be creative people with a background in software development, especially physicists familiar with CERN software (ATLAS, ALICE, CMS) and computer scientists, preferably with knowledge of Grid and in particular NorduGrid ARC and dCache. NorduGrid participates in the Supercomputing '08 research exhibit. Demonstrations of the new components of ARC middleware, GIN demos and presentation of related projects (KnowARC, NDGF, NGIn) will be given at our booth #283. NB! ARC release 0.6.4 exposed a dormant bug in Globus which affects sites that do massive data transfers. In case you are affected by the problem, you would need to re-build ARC and some 3rd-party dependencies against a newer Globus. The next stable ARC release will be built against new Globus libraries; the previous stable (0.6.3) is not affected by it. A bug fix update to the stable ARC release, v0.6.4 is now available, both as source code, via binary repositories and by direct download. See Release Notes for details on fixes and extensions. New IGTF CA packages v1.25 are available from the NorduGrid FTP server and repositories. Updates concern contact data of several European; some Asia Pacific CAs are also updated. The annual NorduGrid 2008 conference that brings together ARC-related projects and other Grid initiatives travels outside the Northern Europe for the first time, taking place in Budapest. The Conference is followed by the NGIn Grid School and an ARC technical workshop. Registration is mandatory; conference participation is free of charge. Popular article "The ARC solution for Grid middleware" published in the British Publishers' magazine eStrategies | Projects is now available on this site. IGTF CA packages v1.23 are updated with v1.24; they are available from the NorduGrid FTP server and repositories. The current stable ARC (0.6.3) and old stable version (0.4.5) standalone packages have been updated to include the new certificates. Updates concern CAs of UK, Cyprus, Slovakia, France, US, Portugal, Montenegro and several Asia Pacific CAs. A bug fix update to the stable ARC release, v0.6.3 is now available, both as source code, via binary repositories and by direct download. See Release Notes for details on fixes and extensions. Also note that with the exception of RedHat Linux 7.3 the Globus packages uses the system-provided versions of OpenSSL and OpenLDAP and not those provided by Globus. Updates for IGTF CA packages (v1.22) are available from the NorduGrid FTP server and repositories. The current stable ARC (0.6.2), old stable versions (0.6.1 and 0.4.5) standalone packages have been updated to include the new certificates. Updates concern CAs of Iran, Pakistan and Taiwan. New stable ARC release 0.6.2 is now available, both as source code, via binary repositories and by direct download. See Release Notes for details on fixes and extensions. IMPORTANT updates for IGTF CA packages (v1.21) are available from the NorduGrid FTP server and repositories. The current stable ARC (0.6.1), old stable (0.4.5) and testing (0.6.1.2) standalone packages have been updated to include the new certificates. Note that the package contains high priority security update of the UKeScience Root and Issuing CAs (UK). Lund University announces 4 6-months Early Stage Researcher positions in High Energy Physics and Grid Computing within the EU Marie Curie Programme. Deadline for applications: May 30, 2008. New ARC test packages (0.6.1.2) are available as a preview for the coming release 0.6.2. They include several bug fixes w.r.t. the preview 0.6.1.1, and are built upon the latest Globus Toolkit. The next NorduGrid technical meeting will take place on June 24-26 in Bern, Switzerland, co-hosted with the ARC meets SwiNG event. We invite everybody involved in development of ARC middleware to take part. Preliminary programme, logistics and registration are available via the meeting's agenda page. New ARC test packages (0.6.1.1) are available as a preview for the coming release 0.6.2. Full release notes/changelog will be distributed with the release. There are many bug fixes (and quite likely, some new bugs), and support for SRMv2.2. In addition the binaries now support LFC. To test 0.6.1.1 on your site you can enable the "testing" repository. The repositories are available for RedHat-based distributions and OpenSuSE. Working "standalone" packages are not yet available. Native Debian packages or at least tarballs will also be available later. Updates for IGTF CA packages (v1.20)are available from the NorduGrid FTP server and repositories. The current stable ARC (0.6.1) and old stable (0.4.5) standalone packages have been updated to include the new certificates. The next NorduGrid technical meeting will take place on April 7-8 in Espoo, Finland, co-hosted with the NORDUnet2008 conference. We invite everybody involved in development of ARC middleware to take part. See the details and register yourself at the meeting's agenda page. Updates for IGTF CA packages (v1.19)are available from the NorduGrid FTP server and repositories. The update includes two new national CAs: Ukraine and Mexico. The current stable ARC (0.6.1) and old stable (0.4.5) standalone packages have been updated to include the new certificates. Uppsala University announces a postdoc grid developer position within the EU KnowARC project. Deadline for applications: December 20, 2007. Updates for IGTF CA packages (v1.18) and a new VOMS testing release (1.7.24-2ng) are available from the NorduGrid FTP server and repositories. The current stable ARC (0.6.1) and old stable (0.4.5) standalone packages have been updated to include the new certificates. 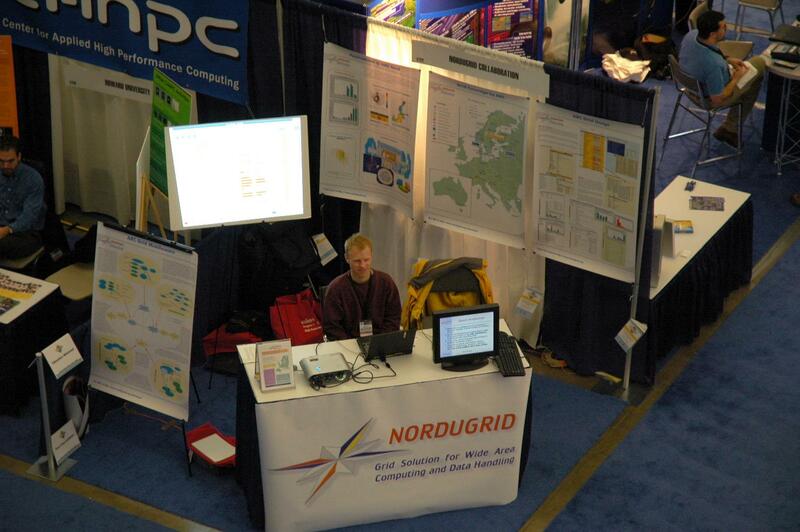 NorduGrid participates in the Supercomputing '07 research exhibit. Demonstrations of the ARC middleware, GIN demos and presentation of related projects (KnowARC, NDGF, NGIn) will be given at our booth #173.
International Grid Trust Federation CA packages v1.17 are available from the NorduGrid FTP server and repositories. The current stable ARC (0.6.1) and old stable (0.4.5) standalone packages have been updated to include these certificates. The Program Committee for the NORDUnet2008 conference "The Biosphere of Grids and Networks" has issued the Call for Papers. Submission deadline is November 1, 2007. ARC bugfix release, version 0.6.1, has been announced during the NorduGrid 2007 Conference in Copenhagen. It is now available through the standard distribution channel. The repositories have been updated with the new binaries which are linked against new versions of the external software (Globus, gSoap, VOMS). Binaries are available for 22 platforms (no Debian/Ubuntu yet). For more details, consult the release notes. Umeå university, Sweden is seeking outstanding candidates for 1-3 Post Doctoral and 1-2 PhD Student positions. The positions focus on design of service-oriented Grid infrastructure in projects funded by the Swedish Research Council and EU. See the GIRD project site for current research. NorduGrid together with EU KnowARC project and NDGF opens a booth at CHEP07 Conference at Victoria, BC, Canada. NDGF and University of Oslo also provide several conference contributions. Test release ARC v0.6.0.3 is available as a 0.6.1 release candidate. It includes new back-ends framework by KnowARC and GridFTPv2 support by NDGF. Binaries are built against Globus 4.0.5 and VOMS 1.7.20. RPMs are avalable via NorduGrid testing yum repository for several RedHat, Fedora and OpenSuSE versions. International Grid Trust Federation CA packages v1.15 are available from the NorduGrid FTP server and repositories. Users and site administrators are advised to upgrade to this version. International Grid Trust Federation CA packages v1.14 are available from the NorduGrid FTP server and repositories. The current stable ARC (0.6.0) and old stable (0.4.5) standalone packages have been updated to include these certificates. Second stable release of ARC, version 0.6, is available for download from NorduGrid repositories. Sites and individual users deploying older versons 0.4.x are strongly recommended to install release 0.6.x. For more details, consult Release Notes. The NorduGrid Conference 2007 and NGIn Grid School will take place in Copenhagen, Denmark, on September 24-28, 2007. Registration is open at the Conference Web page. Participation is free of charge. Hotel booking deadline is June 25. The next NorduGrid Technical meeting will take place in Lübeck, Germany, on May 2-4, 2007. Everybody who contributes to the ARC code or plans to do it in future, or wishes to influence its development, is very much welcomed. Details and registration form are available from the meeting agenda page. Participation is free of charge. International Grid Trust Federation CA packages v1.13 are available from the NorduGrid FTP server and repositories. The current stable ARC (0.6.0) and old stable (0.4.5) standalone packages have been updated to include these certificates. Lifetime of the NorduGrid CA is extended for 2 years. International Grid Trust Federation CA packages v1.12 are available from the NorduGrid FTP server and repositories. The current stable ARC (0.6.0) and old stable (0.4.5) standalone packages have been updated to include these certificates. The next NorduGrid Technical meeting will take place in Lund, Sweden, on February 19-21, 2007. Everybody who contributes to the ARC code or plans to do it in future, or wishes to influence its development, is very much welcomed. Details and registration form are available from the meeting agenda page. Participation is free of charge. NB: as a next step towards the new stable release 0.6, all the ARC-related packages starting from December 18 nightly build have prefix nordugrid-arc- instead of nordugrid-. An immedate implication is that the standalone tarball will unpack by default into nordugrid-arc-standalone, thus the users that have the standalone setup done automatically via login scripts, should either change the directory name to nordugrid-standalone, or modify the login scripts, if they wish to use tags 0.5.38+. 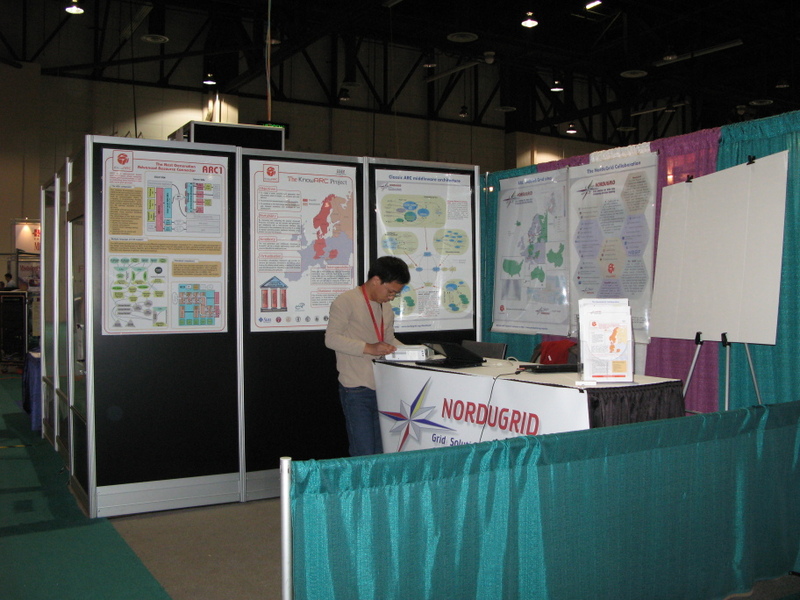 NorduGrid participates in the Supercomputing '06 research exhibit. Demonstrations of the ARC middleware and presentation of related projects will be given at our booth #1900. Joint EGEE/OSG/NorduGrid Grid Service Information Discovery Meeting will be held on December 12-14, 2006, at the NDGF premises in Copenhagen. Visit the meeting page for more details. International Grid Trust Federation CA packages v1.10 are available from the NorduGrid FTP server and repositories. Most notably, it includes new certificates for CERN and INFN CAs. ARC middleware development tag 0.5.56 is available via the downloads area and the yum/apt repositories. The tag addresses few bug fixes. Registration is open for the 1st KnowARC Conference, to be held on November 7-9, 2006, in Oslo. Nordic Data Grid Facility invites applications for Grid middleware developer positions. Main task will be to contribute to ARC middleware development. ARC middleware development tag 0.5.55 is available via the downloads area and the yum/apt repositories. The main change is the new schema for packaging libraries and obsolete tools. International Grid Trust Federation CA packages v1.8 are available from the NorduGrid FTP server and repositories. NorduGrid and KnowARC organize an ARC Design Week, to be held on September 4-8, 2006, in Budapest and Sárospatak, Hungary. Everybody willing to contribute to the future ARC design is welcomed to attend and to register. ARC middleware development tag 0.5.52 is available via the downloads area and the yum/apt repositories. It contains few bug fixes and an experimental support for the LHC File Catalogue data indexing service (LFC). International Grid Trust Federation CA packages v1.7 are available from the NorduGrid FTP server and repositories. The first complete overview of the Advanced Resource Connector middleware (ARC) is accepted for publication in the FGCS journal and is available online for the subscribers. Nordic Data Grid Facility is seeking a Software Coordinator to manage, oversee and coordinate Grid middleware development. International Grid Trust Federation CA packages v1.6 are available from the NorduGrid FTP server and repositories. ARC is the basis for the new EU FP6 project, KnowARC. In the coming 3 years, KnowARC will help bringing ARC to the level of the next generation Grid softwares. A PhD Position in medical image analysis based on grid networks is available in Geneva University, Switzerland. The sucessful applicant will be involved in the KnowARC project that develops middleware based on the NorduGrid ARC. More details here. International Grid Trust Federation CA packages v1.4 are available from the NorduGrid FTP server and repositories. This release is especially important due to the extension of the NorduGrid CA certificate. ARC middleware development tag 0.5.47 is available via the downloads area and the yum/apt repositories. The tag is expected to be the last before the first 0.6 release candidate. International Grid Trust Federation CA packages v1.1 are available from the NorduGrid FTP server and repositories. Update includes new authorities, removal of obsolete/expired credentials, problem fixes. Sites and users are strongly encouraged to upgrade. Umeå University announces a postdoctoral position in Grid computing, for development of software to be contributed to the NorduGrid ARC and to the Globus Toolkit. More information is available here. The 2nd Nordic Grid Neighbourhood Conference will be held in Otaniemi near Helsinki during May 31 - June 2, 2006. The conference is targeted at Grid users and developers in the Nordic and Baltic countries and Russia as well as those interested in the possibilities of Grid computing. More information and the registration form are available at the Conference Web site. ARC middleware development tag 0.5.41 is available via the downloads area and the yum/apt repositories. The tag contains multiple bug fixes and is expected to be close to a production quality. NorduGrid gives an invited talk at the GGF16 in Athens. Slides are available in the "Documentation" section of this site. NorduGrid/ARC resource owners and users are invited to test the pilot release of the Tycoon Grid Market system, that aims to introduce market-based resource scheduling and allocation into the Grid. The product is developed by HP Labs and is integrated with ARC-based Grid at PDC. By providing resources to the Grid Market, owners earn credits that allow them to use other resources on the Market. The Material Sciences national computing infrastructure M-grid in Finland issues a press release, marking the start of operations of one of the world's first production Grids, and the most powerful computing system in Finland. M-grid makes use of the NorduGrid ARC middleware, and is a part of the NorduGrid infrastructure. Book a trip to Uppsala on January 16-20, 2006: the 5th Nordic Grid Neighborhood Workshop (January 19-20) will be held in conjunction with the NorduGrid-LCG Interoperability meeting (January 18), the NorduGrid technical workshop (January 16-17) and the Nordic Tier1 meeting (January 20). Travel and accomodation details and the registration form are available at the Workshop's Web site. NorduGrid participates in the Supercomputing '05 research exhibition. Demonstrations of the ARC middleware, its applicability and technical details will be given at our booth #6218. The International Grid Trust Federation (IGTF) was officially established. The IGTF is a federation of certification authorities and major grid infrastructure projects that together define the policies and standards for grid identity management. IGTF will be the official distributor of CA credential meta-packages. NorduGrid CA is among the founding members of the IGTF. The NorduGrid/ARC tutorial and hands-on exercises will take place during the Grids @ work event in France on October 14. Participants are asked to register. The tutorial will accompany the NorduGrid Open Day that will include also ARC technical talks and discussions. The NorduGrid's ARC middleware was presented on the LHC Grid Deployment Board Meeting, the slides give detailed overview of the ARC components and also describe interoperability issues. Qoucirca, an independent European analyst organisation, publishes a Grid Computing Update report, commissioned by Oracle. Among other points, the executive summary notes that "the highest local adoption rates worldwide were recorded in the Nordic region of Europe, which had a Commitment Index of 3.60", as compared e.g. to 3.02 in North America, 2.70 in Europe, and 1.74 in Asia Pacific. ARC release 0.4.5 (no joking) is made available on the Web site, via the FTP repository and via yum/apt repository at ftp://ftp.nordugrid.org/repos/<OS>/$releasever/$basearch/stable/. It contains several important bug fixes (see the Release Notes), and sites are advised to upgrade. The 4th Nordic Grid Neighborhood Workshop will take place in St. Petersburg, Russia, May 19-22 2005. Participants are URGED to follow the instructions on the Web page and provide details for visa applications before March 25, 2005. NorduGrid participates in the Compute Resource Management Workshop, that brings together all the major Grid middleware producers. The workshop concentrates on interoperability issues. See the minutes for details and some slides. NorduGrid gives a presentation at the globusWORLD™ event in Boston, in section "Real-World Experience Using Grid Infrastructures". On February 15, NorduGrid will hold a Special Event Track at the European Grid Conference 2005 in Amsterdam. Participans are invited to attend the presentations and live demonstrations. Most slides are available. 3d NGN Workshop will be held in Vilnius, on March 17-18, 2005. The meeting will be dedicated to users experience with the Grid, deployment and implementation of Grid solutions. Please submit your talks to the organizers. Registration is necessary for all the participants. 2nd NGN Workshop will be held in Tallinn on January 19-21, 2005. Registration is necessary for all the participants. To take part in the tutorials, please use a separate registration form. The Globus bugfix release 2.4.3-16ng is now available. It can be downloaded from the usual place at ftp://ftp.nordugrid.org/external/globus/2.4.3/, or via the "Downloads" section (external software). One week left until registration closes for the NGSSC course in Grid Computing. The registration form (and further information about the course) is available at http://www.nsc.liu.se/ngssc-grid/. Minutes of the NorduGrid technical meeting in Linköping (October 18-19) are made available. ARC release 0.4.4 is made available on the Web site or via the FTP repository. It contains several important bug fixes (see the Release Notes), and sites are advised to upgrade. The Nordic Grid Neighborhood project will have its first meeting in Linköping, Sweden, on October 20, 2004. Registration is provided at the project's Web page. The NorduGrid technical meeting will take place before that, on October 18-19. NorduGrid's ARC will be built on GT3. This was decided during the NorduGrid technical meeting held on September 13-15 in Lund, Sweden. The 7th NorduGrid Workshop in Copenhagen was dedicated to cooperation with other projects, such as NDGF and LCG, as well as to extending the collaboration. The technical meeting took place one day before. ARC release 0.4.3 is made available on the Web site or via the FTP repository. It contains several fixes, mostly essential for the ATLAS Data Challenges. It is recommended to deploy it in conjunction with the NorduGrid-patched GT2 release globus-2.4.3-10ng, also available from the NorduGrid Web site (external software). With addition of the newly gridified Horseshoe supercluster, NorduGrid middleware connects 2160+ CPUs which processed at the peak over 260 Grid jobs and over 1300 locally submitted ones simultaneously. NorduGrid is glad to announce the first official release of the ARC Grid middleware. Latest packages of the 0.4 series can be downloaded through the "Releases" section on the Web site or via the FTP repository. The next bimonthly NorduGrid technical meeting will take place in Helsinki, on March 29 and 30. Details about registration and tentative agenda can be found here. SUSE 8.1, 8.2 and 9.0 binaries of the NorduGrid middleware and all the required external software, such as the Globus Toolkit 2, are available from the download area. CSC and NDGF organize a Grid Workshop to expand the user base in grid-computing activities. The workshop is targeted at scientists with interest in running their applications in a grid environment. It is oriented towards practical usage, introducing grid computing concepts and tools on the NorduGrid platform. SWEGRID will be officialy launched during the inauguration meeting in Uppsala on March 18. NorduGrid is deployed over 30+ sites, totaling 1355+ CPUs. Apart of individual sites, the SWEGRID testbed and Danish Center for Grid Computing use the NorduGrid middleware to interconnect their resources. With inclusion of test setups in Slovakia and Estonia, the NorduGrid universe spread outside the Nordic countries. NorduGrid gave a seminar at the Estonian Academy of Sciences. Slides are available in the "Documentation" area. For the first time NorduGrid is acknowledged as one of the major production Grid deployments in Ian Foster's talk "Globus and Grid: State of the Union" at the GlobusWORLD event. The bimonthly NorduGrid technical workshop will take place in Tallinn, on January 22-24. It is hosted by the National Institute of Chemical Physics and Biophysics and will include a general public section on Grids. Participants are asked to fill the registration form. Grid resources will be largely unsupported during the holiday season; power outages due to unexpected snowfalls are anticipated. NorduGrid presentation at the 4th International Workshop on Grid Computing (Grid2003) marks one year of the stable testbed deployment and underscores departure from GRAM and other Globus services. The 6th NorduGrid Workshop will take place in Lund, November 27, 2003, in conjunction with the 8th Nordic LHC Physics Workshop. NorduGrid technical group publishes a task list for potential new developers, students and other researchers. Those willing to collaborate and contribute, should contact the NorduGrid staff. Center for Parallel Computers of the Royal Institute of Technology, Stockholm, will give a Grid Computing course on August 18 to 26, 2003. The course is primarily intended for the Swedish students. New officials were elected during the 5th NorduGrid Workshop: Farid Ould-Saada replaced John Renner Hansen as the chairman of the steering board, and BalÃ¡zs KÃ³nya became the technical coordinator. The NorduGrid bug tracking system is set up, using the Bugzilla tool. An important step in the ATLAS Data Challenges is accomplished on the NorduGrid. The total of 850 jobs processed ca 300 000 events of proton-proton collisions in various conditions. Processing was completed in 11 days, and due to the high memory consumption, the jobs were scheduled by the Grid mostly to the production clusters of the Nordic supercomputer centers. The Parallab Linux Cluster carried out most of the task, with the HPC2N Super-cluster and the Monolith cluster of NSC contributing significantly as well. Nordic Data Grid Facility announced three postdoctoral positions. PhD Student Position in Grid Computing, The Department of Computing Science and High Performance Computing Center North (HPC2N) at Umeå University, Sweden. Position as postdoctoral research associate in physics at The Department of Physics, University of Oslo, Norway. The Monolith Cluster in the National Supercomputer Center in Linköping, Sweden, has the NorduGrid toolkit installed. Monolith is ranked 51st on the TOP 500 Supercomputer Sites listing, 14th in Europe, number 2 in the Nordic countries, and number 1 in Sweden. The HPC2N Super Cluster in Umeå, Sweden, has the NorduGrid toolkit installed, and is validated to run ATLAS Data Challenges. Researchers from Helsinki Institute of Physics report successful tests of NorduGrid applications on their installations. NorduGrid have given a presentation and a tutorial during the 3rd Annual Workshop on Linux Clusters for Super Computing, 23-25 October 2002, organized by the National Supercomputer Centre in Linköping, Sweden. The tutorial material is available from this site. The Nordic share of the the ATLAS Data Challenge 1 (phase 1) is completed using entirely the NorduGrid tools. In total, 1300 jobs were successfully executed, analyzing 200 GB of input data, distributed across the Nordic countries, and producing 765 GB of output data, in 530 CPU-days. The 4th NorduGrid Workshop will be held on November 11-12, 2002, in Uppsala, Sweden. The Beowulf cluster Ingvar of NSC, Linköping, has the NorduGrid and ATLAS software installed, and is validated to be used in the ATLAS Data Challenges. The NorduGrid middleware and the testbed are successfuly deployed in a production environment. The first stage of the ATLAS Data Challenge 1 (phase 1) is completed using almost entirely the NorduGrid tools and is validated by the ATLAS collaboration. Slides of NorduGrid talks at summer conferences are available. Two more non-dedicated clusters are running NorduGrid tools: the NORDITA Linux cluster in Copenhagen, and the SCFAB cluster in Stockholm. The Beowulf Class I system Grendel has the NorduGrid software installed, and is validated as a NorduGrid resource. It successfully executes ATLAS Data Challenges tasks. "The NorduGrid toolkit user interface" (User Manual) is available. The 3d NorduGrid Workshop will be held on May 23-24 in Helsinki, Finland. It will feature the presentation of the first release of the NorduGrid toolkit. "An Overview of The NorduGrid Architecture Proposal" and a draft description of the "The NorduGrid Information System" are made public. Few recent NorduGrid presentations are added to the site. The report "Comments on Installation Procedure and Usage of Workload Management Software of EU DataGrid" is released. The report "Comments on the Computing Element Information Provider of the European DataGrid Testbed 1" is made public on this site. Using nordugrid.org for mail is currently under consideration. The structure below 1.3.6.1.4.1.11604 has yet to be defined. The NorduGrid Virtual Organisation is established, with the server operating in Lund. GDMP is installed in Uppsala. Globus 2 toolkit is a public beta release. Globus 2 toolkit is installed and tested between Lund, Oslo and Uppsala. The core Globus 2 functionalities have been implemented, the jobmanagers (fork and PBS), the GridFTP server and the default GRIS information service has been set up with the default port numbers. Report on the GridFTP performance at NorduGrid is made public on this site. Registration opened for The 2nd NorduGrid Workshop, Oslo, November 1-2. The current Status Report released. drwxr-xr-x    2 sanjak   epf          4096 Aug  7 22:53 .
drwxr-xr-x    7 sanjak   epf          4096 Aug  7 21:14 ..
drwxr-xr-x    2 sanjak   epf          4096 Aug  7 22:57 .
drwx------    2 50001    grid         4096 Aug  7 22:56 .
drwx------    3 50001    grid         4096 Aug  7 22:56 ..
Uppsala NorduGrid cluster up and running. The Lund grid cluster has been upgraded to 6 Intel Pentium 1GHz processors. Successfull test of Replica and Gsiftp in Uppsala. The link between Uppsala and Copenhagen is established and tested in both directions. [ellert@ellert ~]$ globus-job-run lscf.nbi.dk/jobmanager /bin/echo "Hello World"
lscf:~> globus-job-run ellert.tsl.uu.se/jobmanager /bin/echo "Hello World"
The software repository is set up (protected access). NorduGrid mailing lists for general announcements and technical discussions are set up. Resource specification form (Word Document) is available to be filled by the participants. List of contact persons and an updated list of DataGrid Testebed resources are available as well. A Globus link was successfully established between Uppsala and Lund. The ellert.tsl.uu.se single machine was connected to the Lund Grid cluster through the grid.quark.lu.se master node. Initially we experienced some problems setting up the connection due to the firewall of the Uppsala University. Although they were not very happy, the system administrators were convinced that for experimental purposes the firewall should be opened between the two sites. After this everything worked fine in both directions. For the future it might be a good idea to configure the gatekeepers to use a restricted range of ports for their return connections by setting the GLOBUS_TCP_PORT_RANGE and GLOBUS_UDP_PART_RANGE environment variables. By doing this it will no longer be necessary to open the firewall for traffic on all ports, but only for a limited number of ports. This is probably safer, and could possibly be more acceptable to the security people. The alpha release 4 of the Globus Datagrid software, obtained from the Globus CVS, was successfully installed on the Lund Grid Cluster. The fork and the PBS jobmanagers were both configured on the gatekeeper. The gatekeeper is called grid.quark.lu.se and the default ports were used for Globus services. NorduGrid Certificate Authority has been set up. The Lund cluster is up and ready for testing.